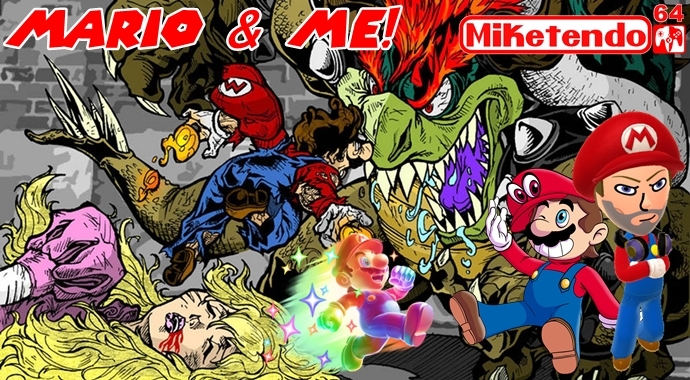 Here at Miketendo64, with the release of Super Mario Odyssey in sight, #MarioWeek has arrived and since Mario means a whole lot to all of us, via a series of posts, you’re going to get to see how much the plumber means to those of us who are part of Miketendo64. Q1. Name and/or Known Alias? I am Mike Scorpio, the devilishly handsome mastermind behind Miketendo64. I created this website as a means to pool as much information about Zelda: Breath Of The Wild into one place to make it easier for others to find the same information. After realizing how much I enjoyed it, I decided to broaden the website to cover News on other games and also conduct interviews with game devs and personalities along with reviewing videogames for Wii U, 3DS & Nintendo Switch. Q2. First Mario game you played? It would be a close match between Donkey Kong or Super Mario Bros on the original NES. I must have been about 3 or 4 at the time and can remember playing with my mum a lot, especially Super Mario Bros 3. That was our favourite. We never turned the console off until we completed the game in fear of losing game save data. Q3. Last Mario game you played? I am currently playing Super Mario World on the SNES Classic edition to sustain my hype for when Super Mario Odyssey arrives. Never really played it before so it is completely new to me and am so far enjoying it. Q4. Favourite Power-up? That would have to be the Hammer Bros suit from the Super Mario Bros 3. It was only available in world 7 I think (The Pipe World). It was a welcomed surprise and allowed Mario a chance to even the playing field, especially against those pesky hammer bros.
Q5. Least favourite Power-up? I can’t say I have a least favourite power up, I enjoy all the different powers Mario can obtain and use though maybe the Bumble Bee outfit was a little, meh! Q6. Favourite Boss Battle? My Favourite boss battle would have to be Super Mario 3D World, though many may disagree. Playing as Cat Mario was one thing, but fighting against Cat Bowser, that was fun. Q7. Least favourite Boss Battle? Any fight against the Koopalings. Jumping on their heads 3 times just to defeat them? Just stand still already! Q8. Mario or Luigi? In my youth I was all about Mario, Poor Luigi was just the character my brother ended up playing when we played together. Since growing up, I have learned there is much more to Luigi than just player 2. Luigi deserves his time in the Spotlight just as much as Mario if not more so. He has to go through just as much crap as Mario to save the princess and doesn’t even get the credit for it. Getting older has taught me to respect the underdog and also to let my brother play as Mario every once in a while. Q9. Princess Peach or Princess Daisy? I have always been a sucker for a blonde but Daisy has much more character and she never seems to get as much love as our darling Princess Peach. Though maybe it’s because Daisy doesn’t get kidnapped quite as often as Peach does. Q10. Metal Mario or Rabbid Mario? Decisions, decisions, My girlfriend just loves the Rabbids so I guess I will have to choose… Metal Mario Mwahaha! Sorry Darling! Q11. Frog Suit or Racoon Suit? Frog Suit, It was always such a fun animation to watch as Mario hopped about on land yet swam so gracefully underwater. Q12. Goombas or Koopa Troopers? I will have to give the Goombas some love this time. They get a bad rap, so much so that my girlfriend refers to them as a certain emoji. For that alone it has to be Goombas. Q13. Super Mario Odyssey, physical or digital purchase? Oh, it has to be physical. I am an old school gamer and love looking at my collection of Game boxes and cases on display. The box art for Super Mario Odyssey Looks stunning and I can’t wait to get my hands on it. Q14. Playing Mario alone, or with a friend? Mario is one of those games that you can play it alone or with a friend “The more, the merrier” is definitely a saying that works well with Mario, especially with Mario Kart, Mario Party, Mario & Sonic at The Olympics or even in Super Mario 3D World. The latter in fact is a whole lot easier when played together. Champion Road was actually beatable with teamwork and copious amounts of alcohol. No Joke, my brother, sister and I drank until we were able to complete the final level with all characters. We did feel the side effects the next day though, but it was worth it, so worth it. Q15. Super Mario 64 and Super Mario Sunshine, or Super Mario Galaxy 1 and 2? I enjoyed both Galaxy games, I really did but it has to be Super Mario 64. I loved the many different levels, the Music on each one. The Dire Dire Docks track is still my favourite and the ingenuity of each puzzle had me entertained for hours. I still go back to it every now and then. A great piece of my childhood right there. Mario is to me, My entire Video gaming life in a Nutshell. It all started with Mario, from Super Mario Bros to Super Mario 3D World, there are few games in the franchise that I haven’t played and that was usually down to not owning that particular console that it featured on. Be it jumping over barrels or stomping Goombas, Mario has come a long way since then and I have to. As his character as grown, I have grown with him. Mario has been pretty much anything from a plumber to a doctor, Kart racer to an intergalactic traveller, and in a way has taught me that I could be anything that I want to be too, though I doubt I will be hopping across galaxies anytime soon. I will always have a special place in my heart for Super Mario alongside my love for all things Zelda. It would have to be whilst filming the Super Mario Maker Bros Show with Jack. He had to put up with a lot of my silliness but we had great fun shooting the studio scenes. Our Halloween Episode gave us a lot of laughs with our dodgy make-up and watching it now has my on the floor every time. I am by no means a good Mario voice actor but when Jack & I are talking to each other as Luigi and Mario, it has me in stitches. EVERYTHING! There is so much to do, so much to see, so little time to do it all in but I don’t care. Mario Odyssey is worth calling in sick for. I am half tempted to run/fall down some stairs so I can play Super Mario Odyssey in the comfort of a Hospital bed as opposed to having to work 12 hour shifts. Then again, I have waited this long to play Mario Odyssey, So Super Mario Odyssey can be a little patient with me to play it. We hope you look forwards to all forthcoming instalments as we have plenty on the way with our second instalment to be posted post-haste!